Bold and marvelous, the Vibrant Hues Bouquet will be a stunning gift to say Thank You, I Love You or Just Because. 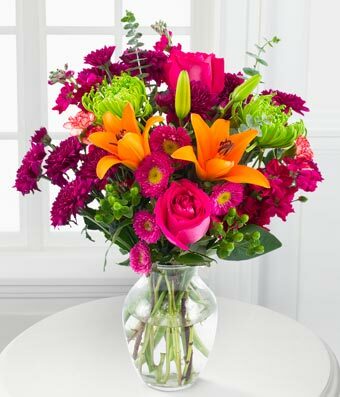 Your special recipient will love having this bright and cheery bouquet in her home or office. Flowers are picked fresh from a farm and delivered in a gift box with a keepsake glass vase. Flower freshness guaranteed.